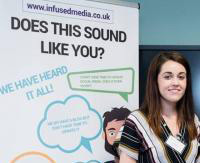 1 Events Media (1EM) are pleased to announce that the next 1EM Networking event in Liverpool (28th Sept 16, 4pm-6pm) will include a short presentation on ‘How to Improve your Digital Footprint’ delivered by the North West based online marketing agency Infused Media. "Online marketing can seem like a daunting way to try and advertise your business, with so many different channels to choose from, business owners are often left confused and unsure of the best methods to generate new leads or sales. We’ll be talking about the two most effective ways of improving your digital footprint, boosting your online presence and generating more income for your company." Some 25 businesses have already registered to attend the event being held on Wednesday 28th September (4pm-6pm) at the Business First Centre, 23 Goodlass Road, Liverpool, L24 9HJ. These 1EM Networking events also include a speed networking session so businesses have an opportunity to make plenty of contacts in a short space of time. "Our networking events have been extremely popular because they are always held in different locations, include speed networking and value adding presentations. The events have been designed to make sure that the participants time is always made worthwhile and beneficial." The event is free to attend and limited to one delegate per company. Additional delegates from the same company will be charged £10 plus VAT. Note: There will be a £10 plus VAT cancellation charge if less than 48 hours notice is given or failure to attend.